Want to build a changelog without adding redundant tables? Check out this DIY validation manager that will help you track your history. I've always had an issue trying to keep a changelog for my entities on a database. In my early projects, I did this just by adding redundant tables to add this information, basically doubling the number of tables in the original database design. Since then, I've been looking for a better way. Today I want to share what I'm brewing as part of Validation Manager, the beginning of a dynamic History system. Below, you'll see the basic design. Basically, a History entity storing version (major.mid.minor), modification time, modification reason, and modifier. 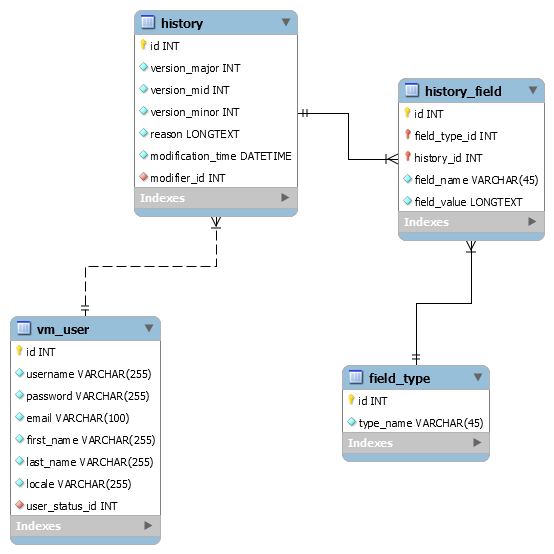 Each history has a series of fields from certain field types. In the entities, there is some plumbing to do. Entities need to extend Versionable, a mapped superclass. * Get history for this entity. * Add history to this entity. * @param history History to add. * Increase minor is done by default when updating a record. || last.getVersionMajor() == v.getMajorVersion() // Or it has a higher mid/major version assigned. //Compare audit field vs. the record in history. Each time an Entity that extends Versionable and has Auditable annotated fields is created/modified, a new history entry is added, assuming the change was on the annotated fields. Other changes don't trigger this system. Add an annotation processor to add the fields mentioned above and create/update an orm.xml file. Have as a separate artifact so it can be reused. Published at DZone with permission of Javier Ortiz . See the original article here.